If you’re doing a coach tour of the Ring of Kerry, you will no doubt be making an early morning stop at the Red Fox Inn, midway between Killorglin and the scenic village of Glenbeigh. Most visitors touring the Ring of Kerry usually start from Killarney and coaches travel the Ring of Kerry in an anti-clockwise direction. Depending on your time of departure from Killarney, you’ll probably arrive at the Fox Inn at about 10:00 a.m.
Not everyone has the constitution to absorb alcohol in the morning, but the Red Fox Inn has a reputation for its Irish coffee and that’s why we’ve stopped here. The Red Fox Inn is an old traditional road house situated next to Kerry Bog Village Museum. Their website says that they cater for coach tours and when we entered the pub, rows of glasses were already filled with generous serves of whisky, ready for the coffee and cream to be added. 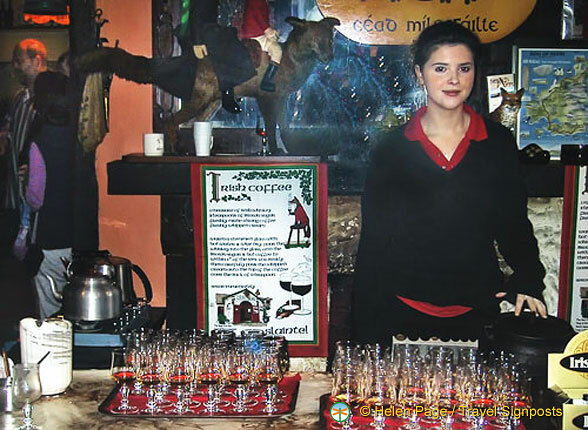 The Red Fox Inn have their own method of making this delightful Irish drink and if you want to find out their method, you can buy tea towels and cards which lets you in on their Irish coffee recipe secret. The Mulvihill family have been running the Red Fox Inn for over 17 years and it’s renowned for its good food as well. Unfortunately we didn’t have time to try the food or visit the Kerry Bog Village Museum on our whistle stop at Glenbeigh. On the Killorglin to Glenbeigh Road, 4.5km outside Killorglin on the main Ring of Kerry Route, the N70. Maybe the Irish Coffee wasn’t that good, but the place was very lovely. And we would like to thank this fam. who gave us a home, far away from home, when we had cartrouble during our holiday. We stayed almost a day, because the car couldn’t be fixed and we still were welcome in the pub! Thanks! By the way, we come from the Netherlands, and have never seen so many friendly people as in Ireland! For a ten am Irish coffee, I thought it was great! We were so excited to be on the Ring of Kerry tour and the Itish coffee was a good kickstart to the day! I highly recommend it. The stop was only for twenty minutes and you can always buy a second cup. Visited the Red Fox Inn on July 4 and it was delightful. I also bought a ring that day in the gift shop – silver and gold and copper. Would love to know brand of that jewelry so I can get some more. Please send info to my email address – thanks! Hi Karen, I’m glad that you enjoyed your visit to the Red Fox Inn. Unfortunately, we don’t have information on the brand of jewelry you bought. Suggest you contact the Red Fox Inn directly. The phone number listed is +353 66 976 9184.